Having trouble with maintaining the formatting (font size) when using method 1 from above. I have designed my label using DYMO Label software. I can print the label with formatting intact, but if use setLabelText(“Will E. CoyotenACME Birdingn2200 Desert Meadows WaynLas Vegas, NV 89122”) Label can be printed with the new text but all formatting is lost. The second way lets you control font attributes and plain text data. There doesn’t seem to be a function setLabelText but setObjectText… can you explain how to use setObjectText? Yeah, I’ve looked at it but I’m having a hard time combining the two concepts. I used TextObject to print, but How would I find the size of the field and how it’s being rendered (font size/style/etc.) so I could determine where to put word breaks to wrap text? 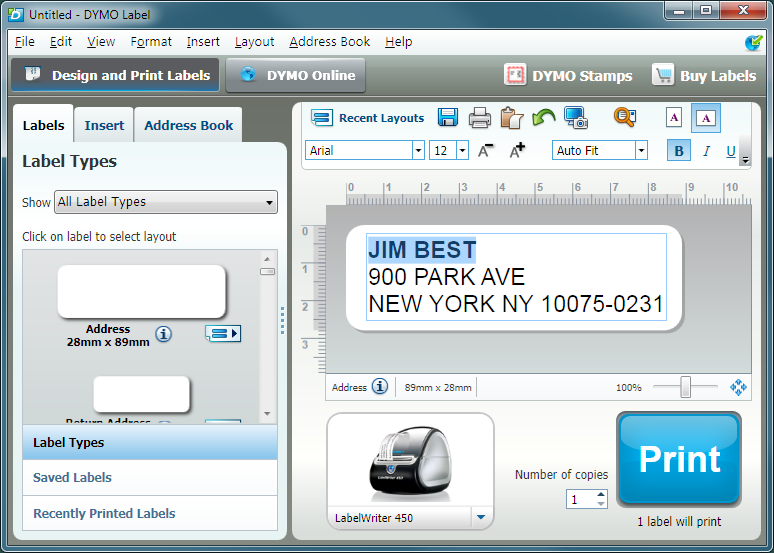 The best approach to your problem is to use DLS to design the label that you want to use. You can set the font and font size too. When you save the label file, it will contain the label xml that you want to include in your labelXml variable. Useful post, thank you! I still am unsure of one thing though: how to change text styles. I looked at the schema and example for Method 2, but I’m unsure how to go about making the input text print out bold without having to manually change it to bold, like in the example. That is, how can I hard code the input text to print out bold every time? As the mentioned in the post, you need to either create a sample file with the formatting you desire or use text markup. The closest you can get to hardcoding would be to use method 1. The best way to see an example is to use DLS to create a label, put some text in a text object and open the label file in any text editor. The file is saved in XML and will be relatively easy to read.